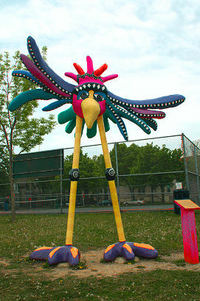 MKEimages.com Image of the Day - Fiberglass animal figures are abound on the Cass Street Playground in Cass Street Park at the corners of Cass and Pleasant on Milwaukee's lower east side. Dragons, birds, and tigers are a few of the colorful and vivid pieces of playground equipment located here. Across from Cass St. Elementary School recess is always a fun time for the children.